Real estate transactions are dominated by the exchange of information and consumers are increasingly turning to 'the web' and online tools to improve the process of buying and selling. Instead of home buyers and sellers calling an agent first, consumers now go online first to explore and learn before picking up the phone. The challenges to the real estate industry is to change the way services are developed, marketed and delivered so they best meet the needs of the modern consumer. ViewPoint Realty Services Inc. is both an interactive service provider and a fully licensed real estate brokerage with certified REALTORS® and MLS® listings. The focus of ViewPoint is to provide the consumer with all the technology and online assets necessary to make their transaction efficient, less expensive, less "sales-y" and more fun. For more information on ViewPoint, please visit www.viewpoint.ca. TrueCheck is a welcome convenience for tens of thousands of Canadians (and growing!) who need a criminal record clearance from police. 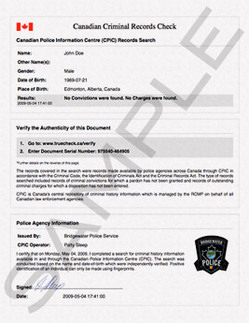 Whether for work, education, travel or volunteer purposes, TrueCheck provides Canada's only online service for ordering such checks from police. Some 2 million Canadians require criminal record checks each year and until TrueCheck, the majority were burdened with the inconvenience and intimidation of needing to show up in person at a local police station to get in line to complete a simple form - and then having to wait days or weeks for results. Today consumers and corporations enjoy a self-service streamlined service that reduces the cost, time and hassle associated with meeting this routine compliance requirement. Consumers can now submit their requests online in less than 5 minutes and receive results within hours. that consumers will pay a higher price for convenience, all while increasing customer satisfaction. In June, 2009, ServicePoint sold the TrueCheck business to a market leader in Canadian background checks and related services. 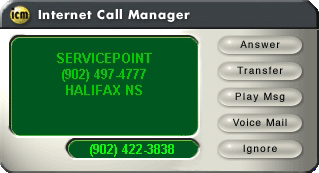 Internet Call Manager is offered by local telephone companies in North America under their own brands. ServicePoint has a fully-equipped data centre with full fibre access, power backup, fire suppression and security. ServicePoint offers space in this facility to firms in the Halifax area who are interested in having their own equipment nearby at a reasonable price. For more information on Co-Location Services, please visit www.servicepoint.ca/colocation.